They look weird, but an advantage of tank top heaters over their freestanding counterpart is that they’re very versatile and easily portable. Freestanding patio heaters such as the Thermo Tiki are more stationary and decorative. When fully assembled, the Dura Heat TT-360 is propane tank with a 360-degree heater on top. It’s the heating solution for campers, hikers, and enthusiasts who love the outdoors but not the cold. It’s also ideal for construction sites and open garages. Is it worth it? Let’s find out what previous buyers have to say about their unit in this Dura Heat TT-360 propane tank top heater review. 3 How Did the Dura Heat TT-360 Fare Among Consumers? – 40,000 BTUs. Just because this heater does not come with sophisticated construction doesn’t mean it can’t produce heat. As advertised, it’s capable of generating up to 40,000 BTUs of heat output. – 360-Degree Heat Radius. 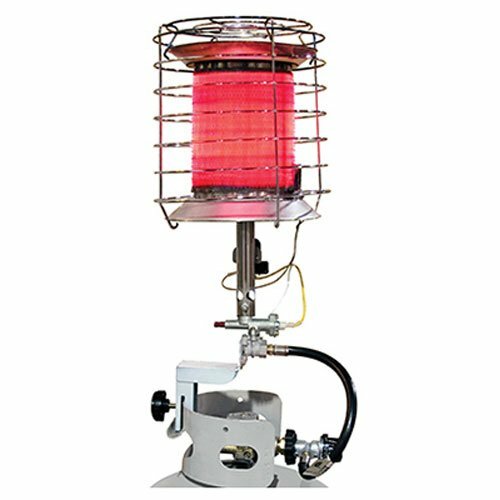 Put this heater in the center of your workplace (or camping spot) so that all of you can enjoy the warmth or heat. – Up to 1,000 Sq. Ft. This outdoor heater can cover a large area of up to 1,000 square feet. – Up to 10.8 Hours. With a 20-lb. propane tank, this tank top heater has a runtime of up to 10.8 hours on its highest setting. On low, it can be used up to 14 hours. – Auto Shutoff. When the tank accidentally gets tipped over, the flow of gas is automatically shut off for your safety. Watch this video for a prouct demonstation of the Dura Heat TT-360. How Did the Dura Heat TT-360 Fare Among Consumers? In this section of our Dura Heat TT-360 propane tank top heater review, we give you a summary of what previous buyers have said about their unit. – Heat Output. The general consensus is that the Dura Heat TT-360 puts out great amount of heat. Many people caution other buyers that it “gets really hot.” One person said that it takes only 10 minutes to heat up his 3-car garage. That said, this heater has been reported to be reliable in the following places: warehouse, garages, outdoors, shop, deck, tailgating, camping. – Size. Another advantage of this tank top heater is that it can fit into sheds and low-ceiling places because of its small and compact size. – Noise. This tank top heater is not loud at all. It does make a sound from the flow of gas. – Usage. The Dura Heat TT-360 is simple and easy to use. However, when lighting it up, you need to hold the valve for approximately 60 seconds or until the heater turns to red before releasing it. – Limitations. This heater is designed for 20-40 lb. tanks only. It can’t be used on larger cylinders (50 lb. or 100 lb.). Also, it doesn’t have a built-in igniter, and there are complaints that it can be difficult to light. The Dura Heat TT-360 is more convenient than a kerosene heater. When it works, it puts out a great amount of heat, making it a reliable outdoor heater for garages, warehouses, and outdoor activities (such as camping and tailgating events). However, the main concern that several buyers have reported is that it can be difficult to light. That said, consider this before making a purchase.